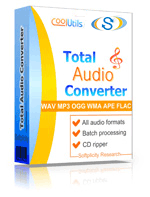 Convert TTA to WMA audio files online and for free! Use a TTA to WMA Online Converter or buy our batch App and save time! Description WMA is a very common and widely spread audio file extension, being only second to MP3. It is regarded as an ultimate competitor for MP3, since it almost pars in sound quality with MP3 at comparable bitrates. WMA Pro is viewed as a professional version of WMA Standard, since it uses an advanced multichannel encoding pattern. Today, WMA Pro is on the way toward getting the status of a standard format for next generation DVD. WMA Lossless was designed for storing and archiving audiodata. WMA Voice is a low-bitrate version of the WMA codec used for storing speech data.